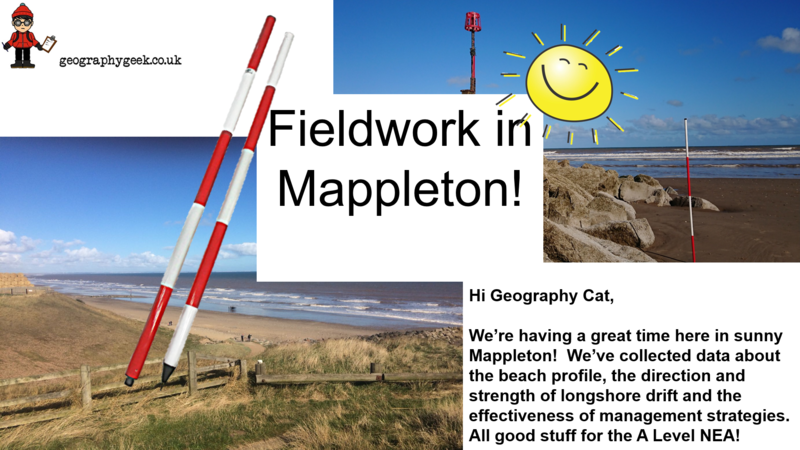 Many thanks to my friend Geography Geek, for sending this postcard of students conducting geography fieldwork at Mappleton, on the Holderness Coast. The rapid rate of erosion here makes it a popular spot for geography fieldtrips. Fieldtrips are more than just fun. Effective fieldwork is essential for any geographer; even an armchair geographer like Geography Cat gets out there and investigates the environment occasionally. You don’t have to be at school to go on a fieldtrip. Everyone can learn more about the world by opening their eyes and their notebooks. Engaging and meaningful fieldwork starts back at the desk, or the armchair, with planning and design. You need to decide what issue you would like to investigate, or which mystery you would like to solve. Maybe you feel there is a need for some local action and you want to gather some data before you put your ideas to others. Decide whether you will use primary or secondary data, or maybe both. Primary data is information you have gathered yourself, secondary data has been collected in the past by someone else. If you’re going to use some secondary data, it’s a good idea to make sure your source is as reliable as possible, but remember it could still be flawed or biased. Collecting your own data means you will have to go somewhere, but it doesn’t have to be far, maybe out in your back yard or along the street where you live. And remember that the “field” of fieldwork doesn’t actually have to be a field. Wherever you go, you must think about the safety implications and the costs in time and money BEFORE you set off. What are you going to do when you get there? You could just take photographs, but why not also try a field sketch? You could just observe, but why not also measure? You could make your own judgements, or you could talk to people and ask them for their opinions too. Whatever you decide to do, Geography Cat recommends that you use a map of the area. You could use an OS Map, GoogleMaps, or your own sketch map for example. Follow up after your fieldtrip by looking through your findings and analysing what you have gathered. Maybe you can reach a conclusion at this point, and answer your initial question. Or, maybe you find that you haven’t got enough data to be able to draw a conclusion. Now think about what you have achieved, be critical and ask yourself whether you collected your data fairly, whether you collected enough, whether you were so adamant about getting a certain answer that you skewed your research and made your own results biased. Whatever happened just be honest with yourself, that’s the way to learn and improve your learning (about geography, about yourself, about everything). There are lots more, and if you’re interested in finding out more please contact Geography Cat. Whatever you do and wherever you go, just remember……..safety first! Putting theory into practice! Fieldwork is so important for learners to fully understand concepts taught in the classroom. Great way to encourage everyone to get out there and look!